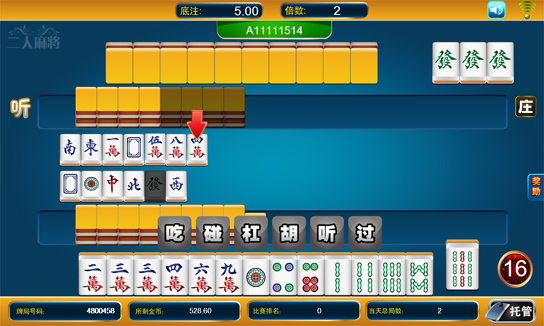 Mahjong for 2 is played by 2 players with total 136 tiles including 36 circles, 36 Characters, 36 Bamboos, 16 Winds and 16 Dragons system randomly choose a player as banker and bid for 1,2 or 3. The opponent has the choice to follow or not. Initially, each player draws 13 tiles. The dealer draws a 14th one, and the game starts, the dealer having the turn. The winning hand is made of four melds (a specific pattern of three pieces) and the eyes (a pair of two identical pieces). There are three ways to form a Kong. Before discarding a player who has all four matching tiles in their hand may declare a kong. They do so by revealing the meld and placing two pieces in the middle face up and two pieces on the ends face down. This is called a concealed or hidden kong. If a player can use a discarded tile to compliment three matching tiles in their hand, they can take the piece and reveal a "kong by discard" or "melded Kong". The player reveals his three pieces face up and places the stolen discard on top of the middle tile. In any case, whenever a Kong is formed, the player must draw an extra tile from the end of the wall and then discard a tile. The fourth piece of the kong is not considered as one of the 13 tiles a player must always have in their hand. Kongs are worth collecting to score more points and/or deprive opponents of obtaining a specific tile. The meld must be in absolute numerical sequence. There is no skipping of numbers, nor does 9 loop around to 1. The sequence must be in the same suit. Eyes also known as a pair, are two identical tiles which are an essential part of a legal winning hand. A piece cannot be stolen (melded) to form the eyes unless the player simultaneously completes a legal winning hand. Draw game happened when last 8th un-drawn tile in the hand. Players who under "ting" are able to pick tile from the last 8th un-drawn tiles include 2 jokers within the time frame. If none of the players get the tile, an abortive draw happened.